Includes all contents of the original “Beginning Rhythm for Preschoolers” released in 2010, and has been updated to include more time signatures, more notes and note combinations, and a 35-page instructional e-book, “Beginning Rhythm”. The printables in this version have been separated from the e-book for easier reading, and are contained in separate files. No resizing should be necessary, check your printer settings before printing. 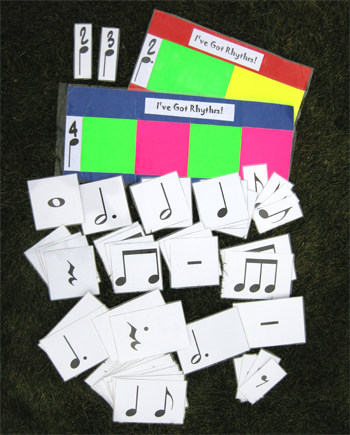 This is the highlight of the whole program, and has already been successfully used with many beginning music students. I hope you enjoy it! Wow--That's a lot of stuff for $10. Well, I learn from you, Dad. This product actually focuses only on rhythm, and the "rainbow castle" was thrown in for fun. There is a solfege version included. I tried to isolate rhythm alone for simplicity.